Morgan CP was the 2nd ever CP that I activated way back in April or there about. I was in Morgan, and saw that Paul (5PAS was going to be heading out, so ducked over to the CP , and set up. I had made a few changes to my portable station and this was a good chance to try them out. Yeah, what I call my SotaPost – it is a 1M long “star” post with a foot peg, handle and pole support welded on. The foot peg, for pushing it into the ground, the handle for well, holding it and also easy removal and the pole support is pretty obvious. The soil is quite sandy (in places where it is not solid rock) at this CP, and I needed to find a suitable location where I could raise the pole the 9M without trees – the pole was a big bonus, and even though it was only in the sand about 300-400mm it was a solid support for the squid pole and the 40M dipole, it did not look like falling over. Now, the other additions which you can’t see (i’ll write up a separate post on later) is an updated power system. Yes, after one too many times of lugging the 9aH SLAB’s around I grabbed a 4S 5000maH LiPo battery, necessary charger and a battery monitor. The biggest benefits are actually that the battery weight has now reduced from 2.7kg down to 530g, which when on a long hike is a massive saving, and this alone allows me to pack my SotaPost and still come in lighter overall! Yes, the 4S LiPo is 14.8V (nominal) and up to 16.85V fully charged, it means I can’t directly connect it to the KX3. But connected to my DC-DC conditioner (which I have mentioned in the past) it worked a real treat, and much to my surprise, this battery source looks like it is going to be very close in usable life to the 9aH SLAB. As you can see from the photo, I chose to just set up in a shady spot to operate from. The weather was near perfect for being out and about, with the temperature in the mid 20’s and a gentle breeze to keep the files away. So, without posting an alert, and just posting a spot to ParksnPeaks website, I started calling on 40M and before long the chasers had found me. It really is an indication that by Spotting when out and about you will get calls. It was a pretty relaxed activation and the calls were fairly steady, no pile-ups, so I was able to have a bit of a chat with the chasers on this activation, rather than the usual (hectic) hello, signal report and move on, which made for a nice change. Literally while waiting for Paul to come on the air, I worked several VK3 and VK5 stations, including a contact with Joe (3YSP) and Julie (3FOWL) who were portable in the Warby-Ovens National Park. 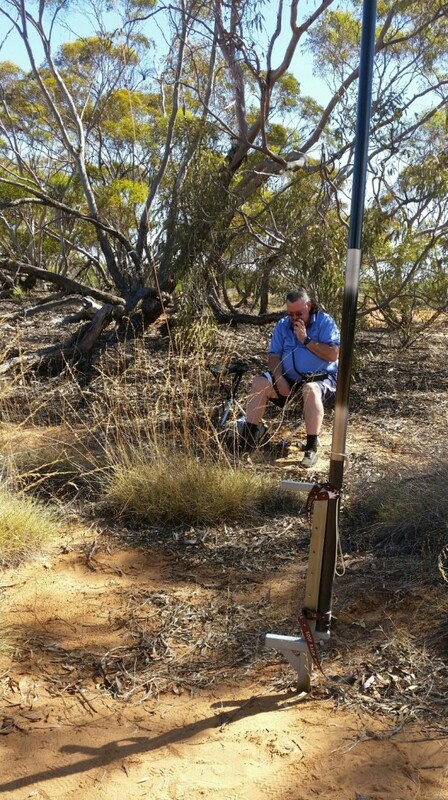 Not long after that, I heard Paul also talking to Joe and Julie before he moved to another frequency, where I was able to make a P2P contact to Paul (5PAS) in Munyaroo CP (via Whyalla). 14 Contacts in around 90 minutes on a very pleasant afternoon – yeah, this is why I love going out portable. My portable operation of 90 Minutes and a check on the LiPo at the end saw that I had only used around 15% of the charge, and given that during this activation the TX time was probably quite high, given I was able to chat a bit more with almost all chasers is an indication that this power solution is more than adequate for at least a full day’s of portable operations. More to come as I actually use it in the coming days. Previous Post3 days 3 new summitsNext PostDon’t take it for granted.